I’ve been seeing the Maximum Ride novels at bookstores for years. 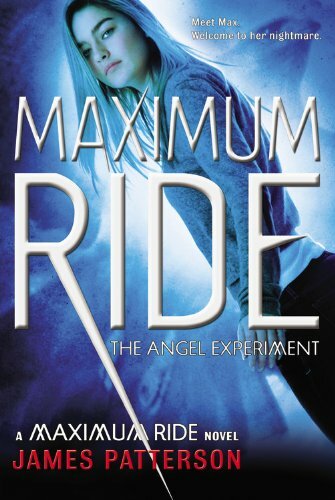 The first book, Maximum Ride: The Angel Experiment came out back in 2005. Since then, that book and the sequels have managed to evade my attention. Well, a couple months ago, my nearby Borders closed and one of the books left on the shelves was Maximum Ride. I decided to buy it since it was cheap and I’ve never read a James Patterson novel before. Maximum Ride isn’t perfect, but the book is interesting enough to make you want to continue on with the sequels. The Angel Experiment is about a group of six kids living together in the wilderness. Why are these kids living alone and in the wilderness? Well, they are a special group of kids because they aren’t completely human. Their DNA was mixed with bird’s DNA as babies, so each one has a set of wings and can fly. In addition, they also are a lot stronger than the average human being. Hence, it’s no surprise that they must hide in the wilderness, away from the evil scientists that made them this way. Yet, the scientists send the evil half human/half wolf Erasers to capture them, and they end up only kidnapping the youngest of the group, six-year-old Angel. With Max as their leader, she and the others make it a mission to get Angel back. The “Why” is what kept me reading. Why did the scientists do this to them? Why are they telling Max certain things? The plot is pretty interesting. The dialogue is a little cheesy and juvenile for a young adult novel, but the action and plot make up for it. Also, the characters are very likeable and charming. Maximum Ride is kickass and great leader. For being only 14 years old, she acts older than her age. I found it weird that despite her maturity, the book still feels more kids’ book, rather than teen novel. The other kids are pretty cool as well. Fang is silent and brooding. Iggy is blind but brilliant. Gasman and Nudge are funny, and little Angel is terrifyingly adorable. I can’t say that the Maximum Ride books are as good as Percy Jackson or other kids’ adventure books, but they are sure entertaining, quick reads. I’ve just finished the second book, and I would say it’s on equal footing with the first. There are seven books in the series so far. I’m unsure if it will hold my interest for that long, but so far it has. These books are great summer reads, and I absolutely recommend to anyone at any age to get lost in a Maximum Ride adventure. You can purchase Maximum Ride: The Angel Experiment in our TYF Store!